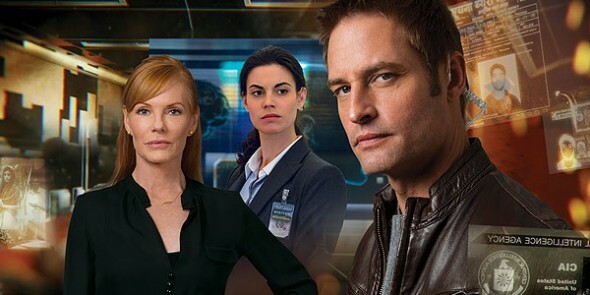 Performers include: Josh Holloway, Marg Helgenberger, Meghan Ory, Michael Rady, John Billingsley, P. J. Byrne, Tomas Arana, Lance Reddick, and Peter Coyote. In this dramatic thriller, Gabriel Vaughn (Josh Holloway) is a high-tech intelligence operative who’s been enhanced with a super-computer microchip in his brain. He’s the first human ever to be connected directly into the global information grid and have complete access to Internet, WiFi, telephone, and satellite data. He can hack into any data center and access key intelligence in the fight to protect the United States from its enemies. Leading the elite government cyber-security agency that was created to support him is Director Lillian Strand (Marg Helgenberger). She’s a straightforward and efficient boss who oversees the unit’s missions. Director Strand assigns Secret Service Agent Riley Neal (Meghan Ory) to protect Gabriel from outside threats — as well as from his appetite for reckless, unpredictable behavior and disregard for protocol. Also on the team is Chris Jameson (Michael Rady), a resourceful federal investigator. Doctor Shenendoah Cassidy (John Billingsley) is the brains behind the design of Gabriel’s chip. His son Nelson (P.J. Byrne) is jealous of Gabriel’s prominent place in his father’s life. As the first supercomputer with a beating heart, Gabriel is the most valuable piece of technology the country has ever created and is the US’s secret weapon. What do you think? Do you like the Intelligence TV series? Do you think it should have been cancelled or renewed for a second season? Intelligence: To Be Cancelled or Renewed for Season Two? I enjoyed Intelligence and was disappointed when it was canceled; also enjoyed Almost Human. I agree with the comments below that these shows were better than the “reality’ shows we skip now. Also agree with the person who asked for more real science in these shows: bring them back with improved science. I very much enjoyed this Series, throughout, espically Athens with the Orion and all the drama. It’s a shame. Should be brought back. I think that they should bring back intelligence, and almost human, I really liked them, they were great shows!! Loved this show, so of course it’s gone. I’m just not sure why everyone is so enthralled with all the ridiculous so called “reality shows”. I watch programming to get away from the stupid people! Bring this show back. Cyber security couldn’t be more in the news. Why kill off a show that could focus public interest on a national security issue and a not too futuristic perspective on how such security could be executed? If they had done more to make the chip function plausible , the viewers would have seen the show’s premise as more credible. Put the science in the sci-fi! It worked for Star Trek. The four major networks ABC, CBS, NBC & FOX ARE SO WRAPPED UP IN THEIR CORNY REALITY SHOWS, they could care less about bringing great shows like Intelligence & Reckless. It’s cheaper to produce the brainless reality shows because they don’t have to pay “real” actors. THANK GOD FOR CABLE !!!!!!!! I really cannot believe cbs actually cancelled Intelligence!!! It was one of the best TV shows on TV. So why not bring it back, PLEASE!!!! I really did enjoy that program. When I had to work I taped it so I wouldn’t miss an episode.